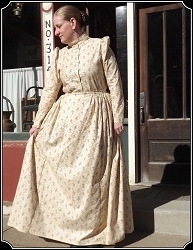 Dresses of the frontier era. Our Day Blouse and Skirt in cotton is a great alternative for the Day Dress, with the look of the one piece dress. This cotton dress has a tighter fitting bodice with darts. A full skirt is gathered into a flattering point in the front and back ~ very period correct. This cotton dress has a tighter fitting bodice with darts. A full skirt is gathered into a flattering point in the front and back ~ very authentic.